In southern Spain, the far-right party Vox has drawn farmers’ votes with a pledge to deport illegal workers. But in this area of southeastern Spain, dubbed ‘Europe’s vegetable garden’, foreign workers are an integral part of the ultra-intensive farming that the regional economy depends on. Riding his bicycle along roads lined with greenhouses, Issa Guebre, 24, says he is paid 36 euros per day to grow melons. He points for instance to those who won’t eat pork at the canteen. ‘When you have to harvest 70,000 kilos of watermelons in 24 hours, you hire those who show up,’ says Salvador, a 64-year-old who refused to give his surname, acknowledging he sometimes hires illegal workers. According to Jose Cueva of the SOC Farmworkers Union, ’20 to 30 percent of (farm) workers are illegal’ in the province of Almeria, one of eight in Andalusia. 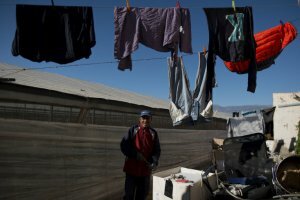 In El Ejido, employers gather illegal workers early in the morning ‘with total impunity’ next to the police station, he says. ‘They would be shooting themselves in the foot: the deportation of illegal immigrants would create a big shortfall in workers,’ he adds.